The North West province of South Africa is located to serve as a gateway to the Southern Africa Development Community (SADEC) with the N4 Highway that connects the Walvisbay Port in Namibia with the Maputo Port in Mozambique running through the province. 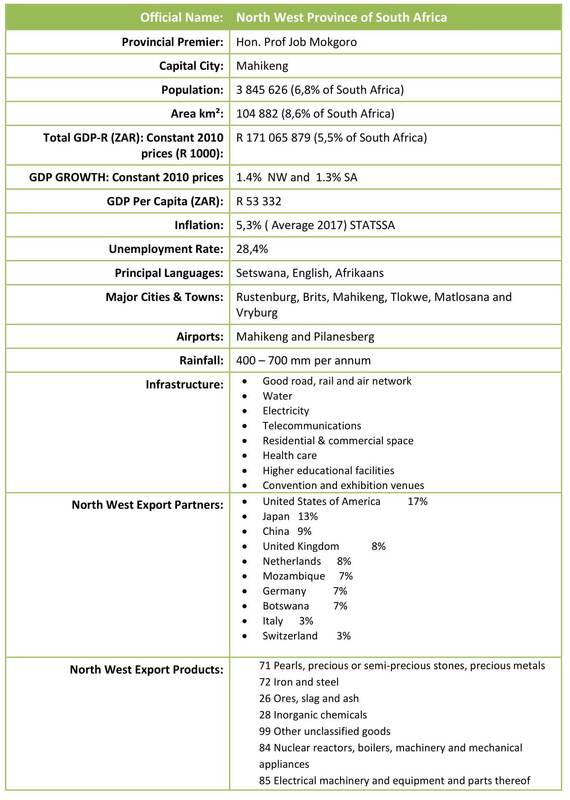 The positioning of the North West province with respect to the rest of the country and the African market makes the region attractive to investors with both a national and continental perspective. Bordering Botswana, the NWP is ideally positioned to access the 14 countries comprising the Southern African Development Community (SADC). The developing SADC Free Trade Area will provide access to a market of over 250 million consumers, while the combined Free Trade Area with SADC, COMESA & EAC will provide access to a market of over 700 million consumers. 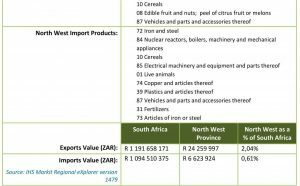 With Gauteng province, the commercial and industrial nerve centre of South Africa on the eastern border of the province, the North West provides easy access to this market as well. 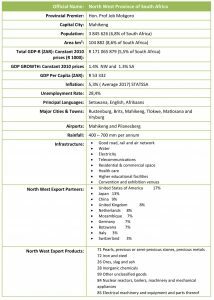 The North West is thus large and significant local economy in the South African economic context. 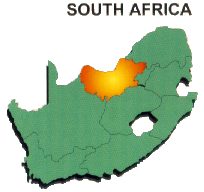 The area contributes approximately 5.66% to national production with mining, agriculture and manufacturing contributing the largest portion of the provincial output, taking into consideration that 65% of the province is rural with a low economic base. 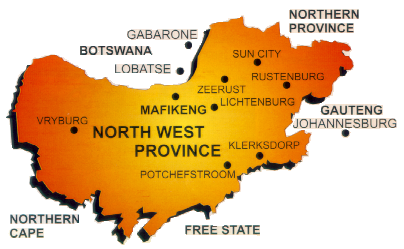 Refer to geo-political advantages of the North West Province, further down on this page. The North West Province endorses and subscribes to the National Development Plan (NDP) as an overarching policy framework that guides implementation across all spheres of government. Bordering Botswana, the NWP is ideally positioned to access the 14 countries comprising the Southern African Development Community (SADEC) and the development of the proposed Trans-Kalahari corridor will enhance NWP access to the West African market. The NWPs well-developed road and rail links provide the platform and infrastructure for ground transportation deep into sub-Saharan Africa. NWP offers easily available skills and distribution channels imperative for agricultural commercial ventures. NWP plays a significant role in the supply of energy, transport and communications to the continent.